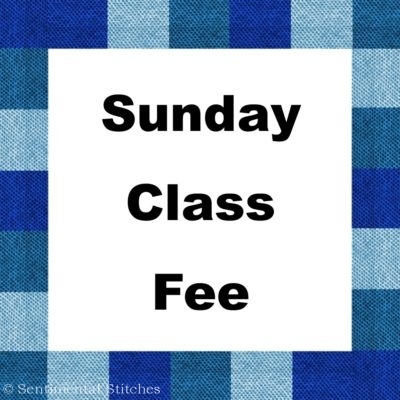 *** if you select Payment by Check – payment must be received within 10 days to reserve your class. Important – You can no longer add multiple attendees to your shopping cart. Each person must sign up individually using their own name and contact information. Multiple registrations from the same person will be deleted. The retreat sewing room will be set up for 2 quilters per 8 foot table. Overflow rooms will be set up for 1 quilter per 6 foot table. To accommodate as many people as possible at this retreat, please leave any side tables home. Sew whenever you want day or night from Wednesday at 11 am until Sunday at 7 pm! There is nice overhead lighting but you might want to bring an Ott Light. There will be at least four ironing stations with full size steam irons. At least two cutting stations with mats and rotary cutters We’ll have extra blades if we need to change them. We have rulers: 4″ x 14″ – 6″ x 24″ – 8 1/2″ x 24″ – 10 1/2″ square and we’ll bring a few extra from home. If you need a special ruler for a project, please bring it with you. A Table for Snacks. You can bring snacks to share for the snack table. We all get hungry late at night. We’ll have paper plates, napkins, silverware, etc. A Sale Table. You can bring quilt related items to sell. Clean out some older things from your stash and shop for new while you’re there! Coffee, tea and water will be available in the sewing room. If you need an iron by your sewing machine it must be one of the small travel or mini irons. We can’t use full size irons at individual tables. Show and Tell on Saturday night. The retreat web site has a packing checklist to help you remember everything. The retreat sewing room is handicap accessible but please contact me prior to the retreat so I can assist you with seating.